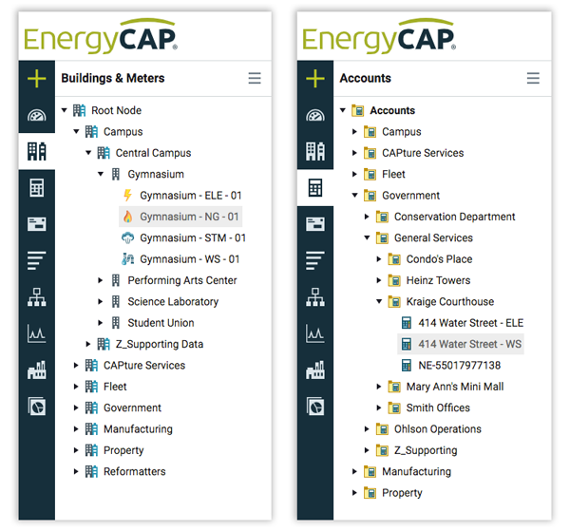 EnergyCAP’s TreeView Navigation is an intuitive and user-friendly hierarchical structure for presenting utility data. There is a TreeView for meters, buildings, and broader organizational divisions, a second for accounts and cost centers, and a third for vendors and rate schedules. These hierarchies are flexible and user-configurable and provide a cohesive structure for categorizing, navigating, and reporting on your data. TreeViews enable you to set up the EnergyCAP database to model your unique organizational structure. You can also assign individual user permissions based on the hierarchy tiers. This simplifies and secures the database by limiting user access to data based on job roles and authorization.